For anyone interested in the Synod, Edward Pentin's book is an essential contribution to the growing corpus of meta-studies on the proceedings. There are many nuggets of interest. 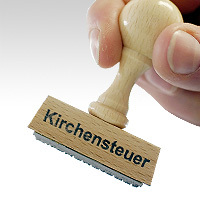 One which jumped out of the (virtual) page was the comment of Professor Stephan Kampowski in relation to the Kirchensteuer, the German Church Tax. The Catholic Church in Germany receives about £5 billion each year give or take a few million. To stop paying the tax, you have to make an official declaration that you are leaving the Church. I am not a moral theologian, but I guess that my colleagues in that discipline might be able to argue that there are grounds for making some sort of mental reservation on the grounds that you do not wish to actually renounce the faith, but wish to pay a little less in support of the Church according to your means. This would be difficult to justify, but plausible - as plausible, say, as arguing that your marriage is dead because you were both a bit young, or felt that you didn't take it all seriously and have now grown apart. However there are different approaches to the two cases. Whereas many of the German bishops are in the vanguard of the campaign to admit the divorced and remarried to Holy Communion, no such mercy is shown to those who refuse the Kirchensteuer. This inconsistency is not an original discovery. Sandro Magister and many others have drawn attention to it before, but it is the first time that it has really struck me and I thought it would be of interest to others. Some of those pushing hardest for the admission of the divorced and remarried to Holy Communion are apparently content to deny Holy Communion and other aspects of participation in the life of the Church to those who do not pay a tax that has made the German Church extraordinarily wealthy.